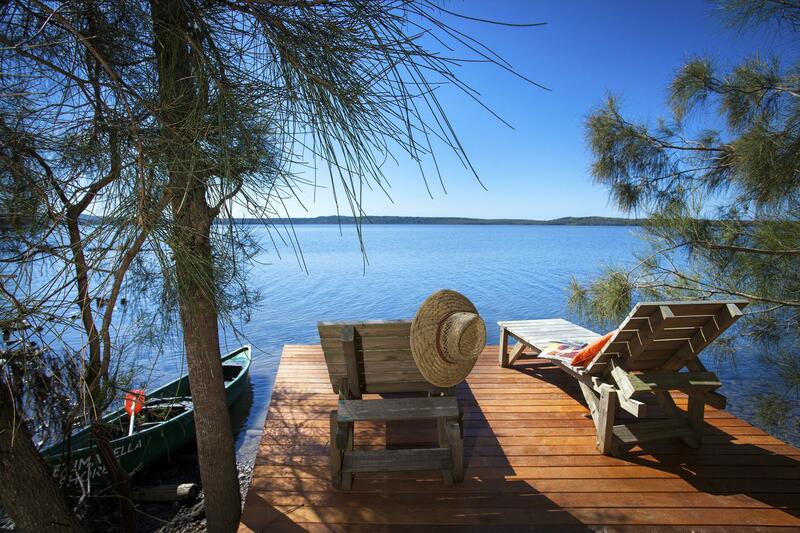 A tranquil retreat perched on the waterfront of Lake Weyba, a short distance from Noosa, but feels a million miles away from its glamorous neighbour. Eumarella Shores promises relaxation, peace & tranquility and delivers on all counts, providing the perfect blend of natural bush setting, eco-friendliness with a touch of luxe. Deluxe lakehouses and luxury lake pavilion accommodation includes complimentary sparkling wine, cheese board and handmade chocolates, luxurious bathrobes and complimentary waffle slippers. Self guided interpretive bushwalk trail to discover bush tucker & indigenous history. Inspired to bird watch? Binoculars & bird caller available at reception, no really! 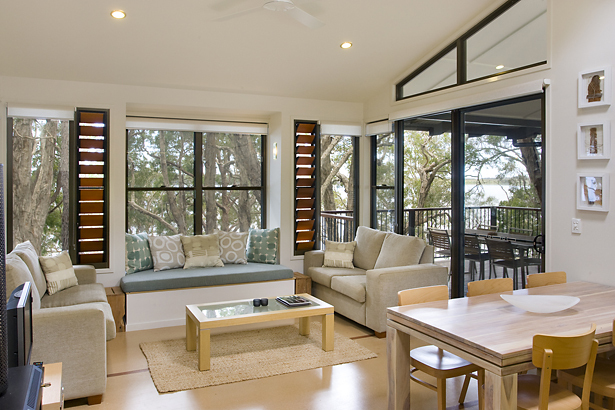 Our lakefront accommodation selection includes traditional and enchanting 4 star cottages, and contemporary 4 star Noosa style lake-houses, plus spacious, air-conditioned, architecturally designed 4.5 star lake-houses through to the absolutely stunning and luxurious award winning 5 star pavilion. 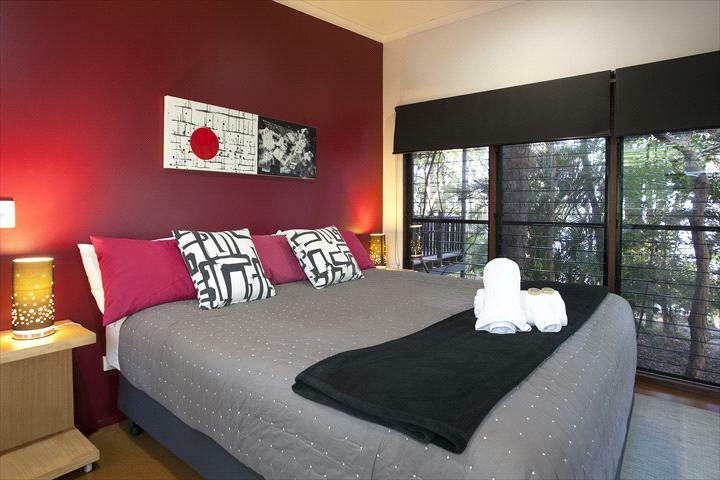 All accommodation is individually themed with contemporary furnishings and decor. 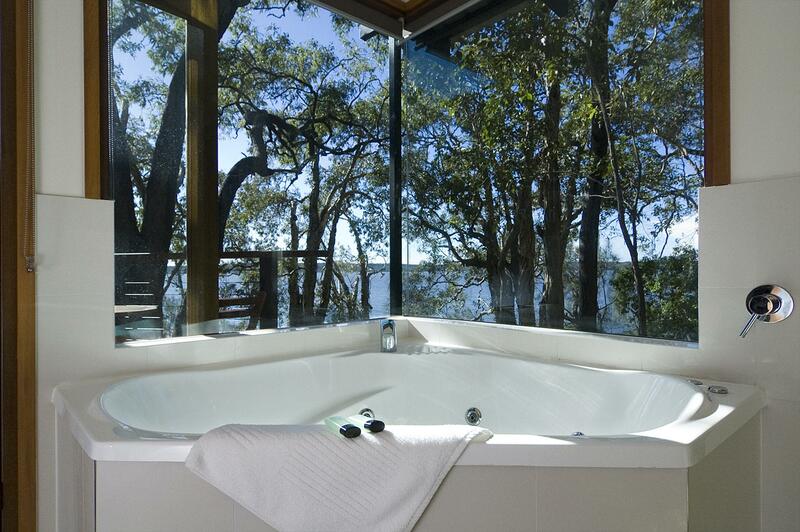 Most bathrooms feature a king single or double spa bath with a view to the lake or unspoilt native bush-land. 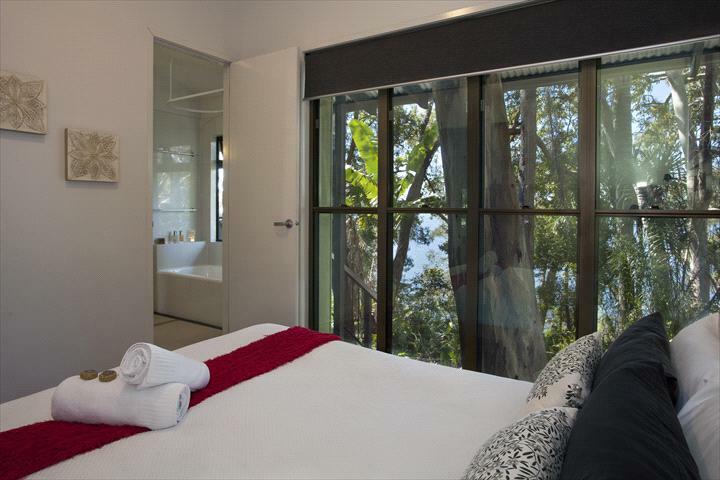 All accommodation options enjoy unparalleled lake vistas, whilst a little further from the water's edge, nestled among native bush garden is the secluded garden lake-house also enjoying beautiful views to the lake from the veranda and featuring 2 bathrooms each with a spa. From the Airport take the Gateway Arterial Motorway to the Bruce Highway. Take the Bruce Highway north. Exit just after the Ettamogah Pub onto the Buderim/Mooloolaba/Sunshine Motorway and follow the signs to Noosa. Turn right at the Eumarella Road exit at the roundabout after the Peregian Springs/Murdering Creek Road roundabout. Alternatively continue north on the Bruce Highway and take the Noosa Eumundi exit. Follow the signs to Noosa on the Noosa Eumundi Road. Travel approximately 7 kilometres and turn right at the roundabout to the Sunshine Motorway that is signed to Coolum. At the next roundabout take the Eumarella Road exit. Turn right onto the David Low Way and turn left at the first roundabout (intersection with Bli Bli Road). Just after this roundabout follow the sign to Noosa, a sharp right u-turn onto the Sunshine Motorway heading north. Continue to follow the signs to Noosa and turn right at the Eumarella Road exit at the roundabout after the Peregian Springs/Murdering Creek Road roundabout. Bookings cancelled 15 days or more prior to arrival will be refunded. Bookings cancelled 14 days or less prior to arrival will only be refunded if the cottage is re-let for the same period. Cancellation fee of $30 applies. A private one bedroom lakehouse, perfect for couples. Accommodation is allocated between either the Studio or Alices Garden lakehouse, based on the availability directly with the property owner. Guests may request the Studio or Alices Garden lakehouse at time of booking, however please note your preference cannot be guaranteed. Both lakehouses are fully self contained with comprehensively equipped kitchens, combined kitchen/dining/lounge with logfire. Both include a private lakeside deck and complimentary use of two person canoe. 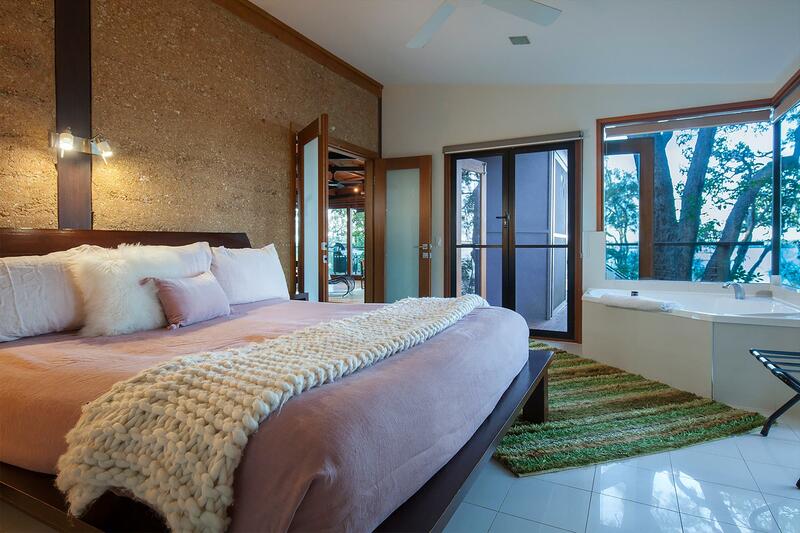 There is a second bedroom within each lakehouse which will simply be locked off during your stay. 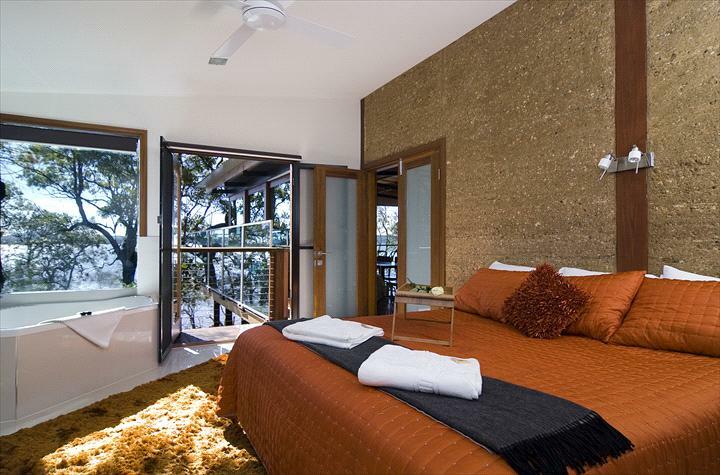 The Studio Lakehouse is located 30 metres from Lakes Edge, verandah with fantastic lake vistas with a king bed and two bathrooms (one with king single spa bath). The Alices Garden Lakehouse is located 60 metres from Lakes Edge, set in a bush garden setting with lake views from verandah. The lakehouse includes a king bed with two bathrooms (one bathroom with a single spa bath and the other bathroom with double spa bath). Escape for three nights within a private one bedroom lakehouse and SAVE $120. *Tariffs displayed have been reduced by $120. *Discount applies for the Triple Treat package. Both lakehouses are fully self contained with comprehensively equipped kitchens, combined kitchen/dining/lounge with logfire. Both include a private lakeside deck and complimentary use of two person canoe. 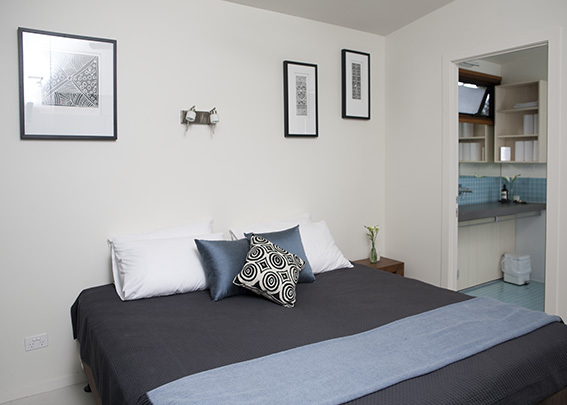 There is a second bedroom at the lakehouse will simply be locked off during your stay. Escape for four nights within a private one bedroom lakehouse and only pay for three. *Discount applies for the Stay 4 Pay 3 package. Both lakehouses are fully self contained with comprehensively equipped kitchens, combined kitchen/dining/lounge with logfire. Both include a private lakeside deck and complimentary use of two person canoe. The Alices Garden lakehouse is located 60 metres from Lakes Edge, set in a bush garden setting with lake views from verandah. The lakehouse includes a king bed with two bathrooms (one bathroom with a single spa bath and the other bathroom with a double spa bath). A private two bedroom lakehouse, perfect for four guests. Accommodation is allocated between either the Studio or Alices Garden lakehouse, based on the availability directly with the property owner. Guests may request the Studio or Alices Garden lakehouse at time of booking, however please note your preference cannot be guaranteed. The Studio lakehouse is located 30 metres from Lakes Edge, verandah with fantastic lake vistas with a king bed and two single beds (or a second king bed if requested at time of booking). The Studio lakehouse has two bathrooms, one bathroom with king single spa bath and the other bathroom with a shower only. The Alices Garden lakehouse is located 60 metres from Lakes Edge set in a bush garden setting with lake views from verandah with a queen bed and two single beds (or a second king bed if requested at time of booking). Alices Garden lakehouse has two bathrooms, one with king single spa bath and the other bathroom with a double spa bath. This lakehouse has private gated lakeside deck. Escape for three nights within a private two bedroom lakehouse and SAVE $120. *Tariffs displayed have been reduced by $120. *Discount applies for the Triple Treat package. A two bedroom lakehouse, perfect for four guests. Accommodation is allocated between either the Studio or Alices Garden lakehouse, based on the availability directly with the property owner. Guests may request the Studio or Alices Garden lakehouse at time of booking, however please note your preference cannot be guaranteed. Alices Garden lakehouse is located 60 metres from Lakes Edge set in a bush garden setting with lake views from verandah with a queen bed and two single beds (or a second king bed if requested at time of booking). Alices Garden lakehouse has two bathrooms, one bathroom with king single spa bath and the other with double spa bath. This lakehouse has private gated lakeside deck. Escape for four nights within a private two bedroom lakehouse and only pay for three. *Discount applies for the Stay 4 Pay 3 package. 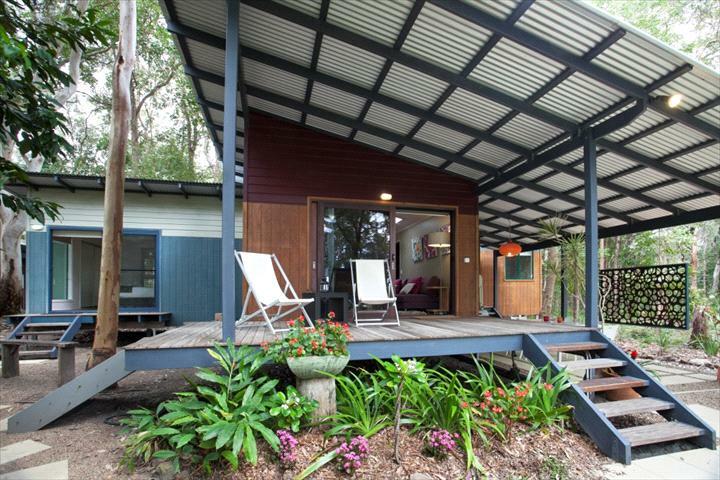 The Studio lakehouse is located 30 metres from Lakes Edge, verandah with fantastic lake vistas with a king bed and two single beds (or a second king bed if requested at time of booking). The Studio lakehouse has two bathrooms (one with king single spa bath, the other bathroom with a shower only). Alices Garden lakehouse is located 60 metres from Lakes Edge set in a bush garden setting with lake views from verandah with a queen bed and two single beds (or a second king bed if requested at time of booking). Alices Garden lakehouse has two bathrooms (one with king single spa bath and the other with double spa bath). This lakehouse has private gated lakeside deck. Romanitc one bedroom cottage, perfect for two guests. Located 10 metres from Lakes Edge. A private one bedroom cottage, perfect for couples. Accommodation is allocated between either the Treetops Deluxe cottage or Cormant Deluxe cottage, based on the availability directly with the property owner. Guests may request the Treetops Deluxe cottage or Cormant Deluxe cottage at time of booking, however, please note your preference cannot be guaranteed. Both cottages are fully self contained, comprehensively equipped kitchen with dishwasher. Combined kitchen/dining and lounge area, complimentary welcome platter on arrival, air conditioning and logfire. Private lakefront deck and complimentary two person canoe. The Treetops Deluxe cottage includes a queen bed and one bathroom (shower only) with bathrobes provided plus complimentary slippers. 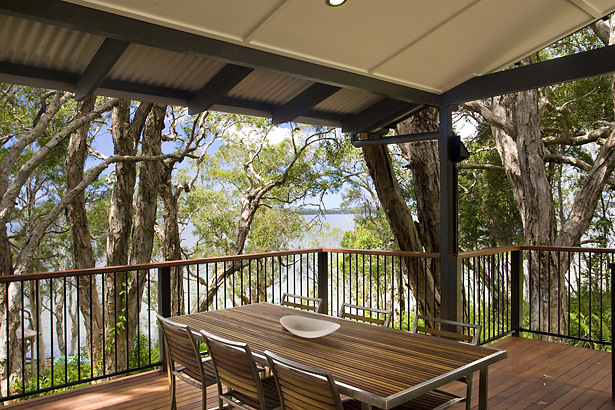 There is a private lakeside timber deck. 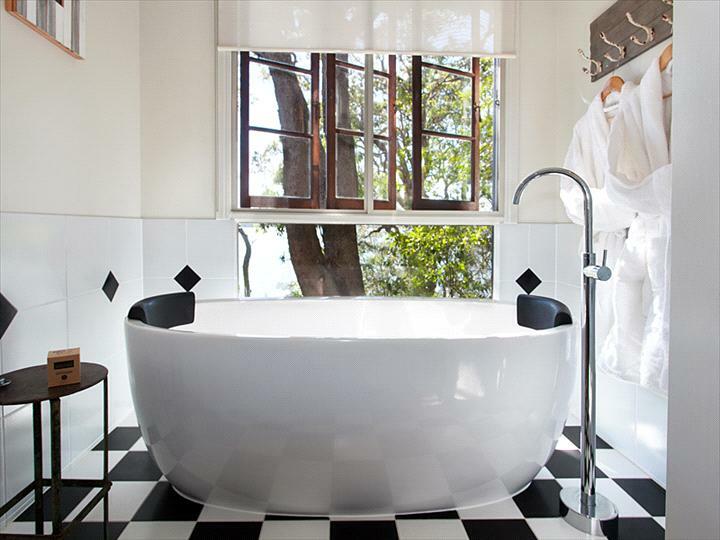 This option has a duo free standing bath with stunning lake views. 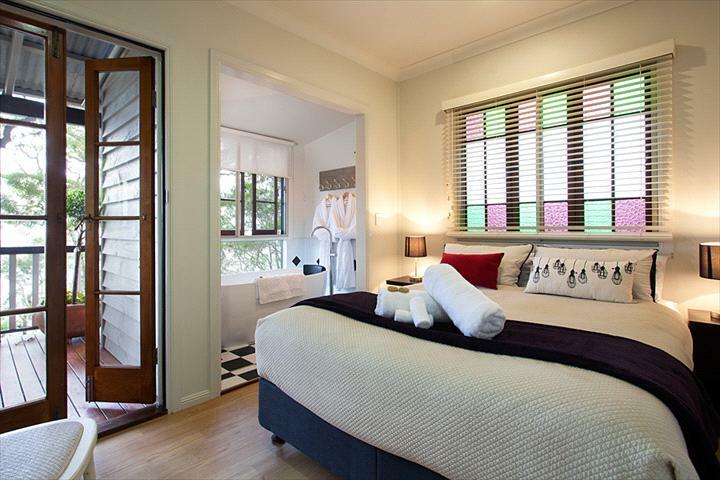 The Cormant Deluxe cottage with a queen bed and one bathroom (shower only). 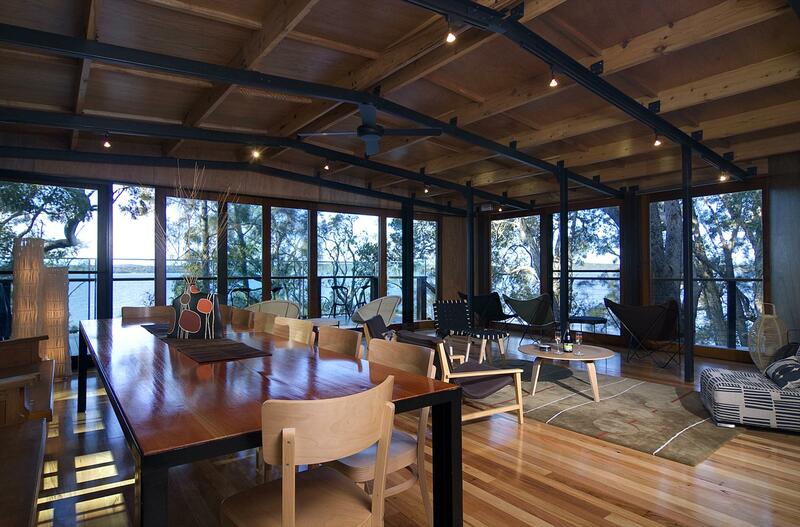 There is a private lakeside timber deck. This option has a double spa bath on glass enclosed verandah. Escape for three nights within a romantic one bedroom cottage and SAVE $120. *Tariffs displayed have been reduced by $120. *Discount applies for the Triple Treat package. A private one bedroom cottage, perfect for couples. Located 10 metres from Lakes Edge. Accommodation is allocated between either the Treetops Deluxe cottage or Cormant Deluxe cottage, based on the availability directly with the property owner. Guests may request the Treetops Deluxe cottage or Cormant Deluxe cottage at time of booking, however, please note your preference cannot be guaranteed. Stay 4 night and pay 3 nights. Romanitc one bedroom cottage, perfect for two guests. Located 10 metres from Lakes Edge. Guests can request to stay at the Cormorant or Treetops Cottage at time of booking, however please note your preference cannot be guaranteed as either cottage will be subject to availability directly with the property owner. A private one bedroom deluxe lakehouse, perfect for couples. Accommodation is allocated between either the Buena Vista lakehouse or Driftwood lakehouse, based on the availability directly with the property owner. Guests may request the Buena Vista lakehouse or Driftwood lakehouse at time of booking, however, please note your preference cannot be guaranteed. Both are located 30 metres from the lakes edge. Fully self contained with combined kitchen/dining/lounge. Comprehensively equipped kitchens and large verandahs with barbeques. Private grassed foreshore areas at lakes edge. Welcome platter on arrival. Buena Vista lakehouse includes a king bed, reverse-cycle air conditioning, one bathroom (king single spa bath) plus powder room. Includes a gas fuelled log fire and complimentary canoe. Driftwood lakehouse has king bed, reverse-cycle air conditioning, two bathrooms (both shower only) plus powder room. Log fire and complimentary kayak. This lakehouse has wheelchair friendly bathroom and entrance ramp. Escape for 3 nights and SAVE $120 (Note: tariffs displayed include the $120 deduction). Both are located 30 metres from the lakes edge. Fully self contained with combined kitchen/dining/lounge. Comprehensively equipped kitchens and large verandahs with barbeques. Driftwood lakehouse has a king bed, reverse-cycle air conditioning, two bathrooms (both shower only) plus powder room. Log fire and complimentary kayak. This lakehouse has wheelchair friendly bathroom and entrance ramp. A private two bedroom deluxe lakehouse, perfect for six guests. Accommodation is allocated between either the Buena Vista lakehouse or Driftwood lakehouse, based on the availability directly with the property owner. Guests may request the Buena Vista lakehouse or Driftwood lakehouse at time of booking, however, please note your preference cannot be guaranteed. Both located 30 metres from the lakes edge. Two bedrooms with combined kitchen/dining/lounge. 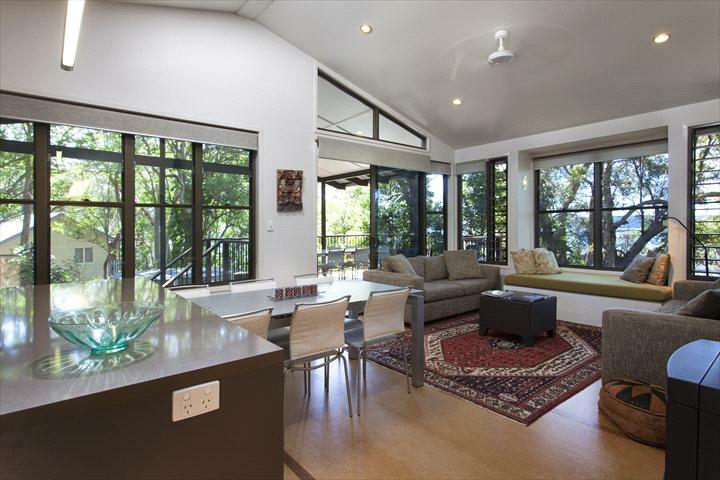 Fully self-contained, comprehensively equipped kitchens and large verandahs with a barbeque. Private grassed foreshore areas at lakes edge. Welcome platter on arrival. Buena Vista lakehouse includes a king bed, two singles or two kings plus double sofabed. Bedding preference must be stated at time of booking. One bathroom (king single spa bath) plus powder room. Gas fuelled log fire and complimentary canoe. Driftwood lakehouse has a queen bed, two singles or a king and queen bed plus double sofabed. Bedding preference must be stated at time of booking. Two bathrooms (both shower only) plus powder room, reverse cycle airconditioner. Log fire and complimentary kayak. This lakehouse has wheelchair friendly bathroom and entrance ramp. Both located 30 metres from the lakes edge. Two bedrooms, fully self-contained with comprehensively equipped kitchens. Combined kitchen/dining/lounge. 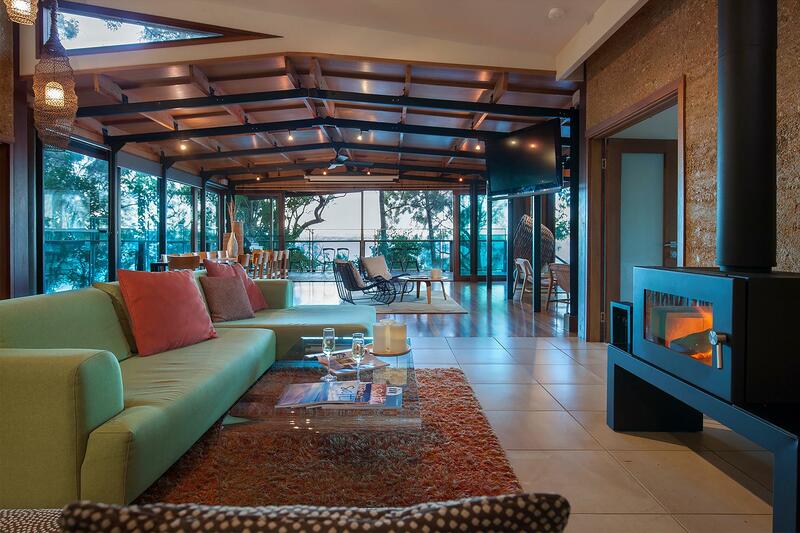 Large verandahs with a barbeque. Private grassed foreshore areas at lakes edge. Welcome platter on arrival. Buena Vista has with king bed, twin singles or two kings plus double sofabed. Bedding preferences must be stated at time of booking. One bathroom (king single spa bath) plus powder room. Gas fueled logfire and complimentary canoe. Driftwood lakehouse has a queen bed, two singles or queen and king plus double sofabed. Bedding preference must be stated at time of booking. Reverse-cycle air conditioning and two bathrooms (both shower only) plus powder room. Logifre and complimentary kayak. This lakehouse has wheelchair friendly bathroom and enrance ramp. Stay 4 nights and pay for 3 nights. Both located 30 metres from the lakes edge. Two bedrooms fully self-contained with comprehensively equipped kitchens. Combined kitchen/dining/lounge. 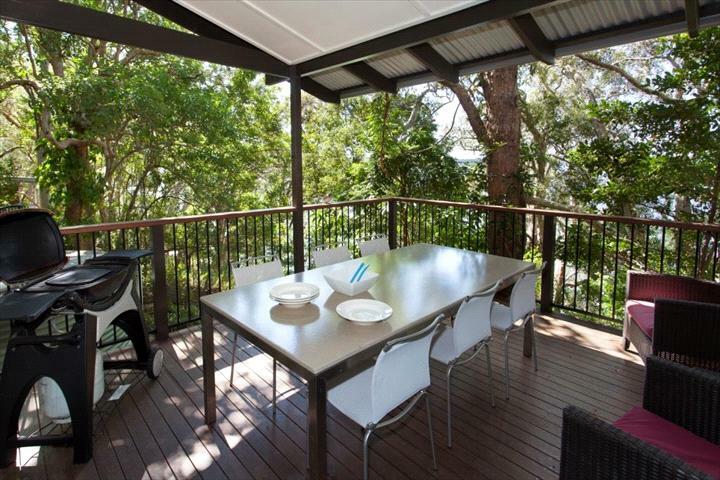 Large verandahs with a barbeque. Private grassed foreshore areas at lakes edge. Welcome platter on arrival. Driftwood lakehouse has a queen bed, two singles or queen and king plus double sofabed. Bedding preferences must be stated at time of booking. Reverse-cycle air conditioning and two bathrooms (both shower only) plus powder room. Logifre and complimentary kayak. This lakehouse has wheelchair friendly bathroom and entrance ramp. Spacious luxury lakehouse, located 8 metres from lakesedge. Contemporary indigenous theme with adobe walls. Fully self-contained, comprehensively equipped kitchen. King bed, ensuite plus two powder rooms. Double Spa bath with lake views. Large verandah with stairs leading down to private lakeside deck hovering over the water. Complimentary two person canoe. Welcome platter on arrival. Spacious luxury lakehouse. Gooloowaa is located 8 metres from lakes edge. Contemporary indigenous theme with adobe walls. Fully self-contained, comprehensively equipped kitchen. King bed, ensuite plus two powder rooms. Double spa bath with lake views. Large verandah with stairs leading down to private lakeside deck hovering over the water. Complimentary two person canoe. Welcome platter on arrival. 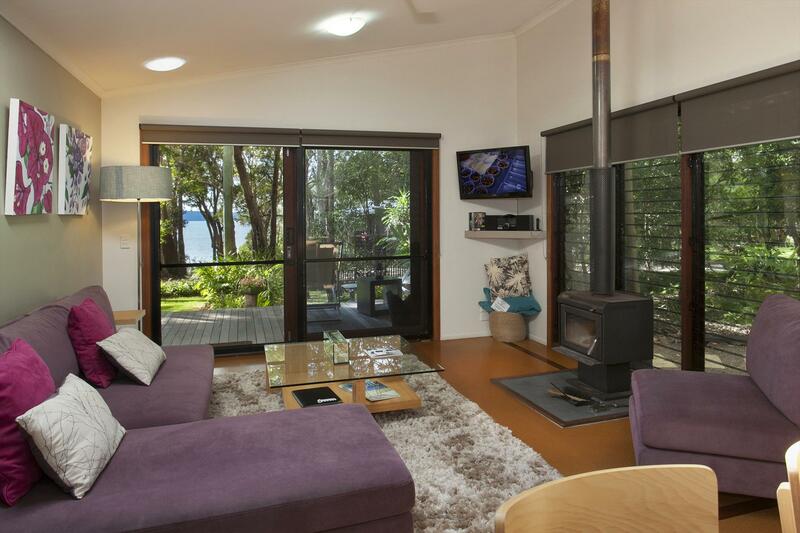 Spacious luxury lakehouse, located 8 metres from lakesedge with stunning lakeviews. Contemporary indigenous theme with adobe walls. Fully self-contained, comprehensively equipped kitchen. Bedroom one contains a king bed, and the second bedroom has either a king or two single beds. Bedding preferences must be stated at time of booking. Both bedrooms with ensuites and double spa baths with views to the lake. Two separate powder rooms. Large verandah with stairs leading down to private lakeside deck hovering over the water. Complimentary two person canoe. Welcome platter on arrival. Spacious luxury lakehouse, located 8 metres from lakesedge. Contemporary indigenous theme with adobe walls. Fully self-contained, comprehensively equipped kitchen. King bed, ensuite and king, or two singles and bathroom, plus two powder rooms. Bedding preferences must be stated at time of booking. Double spa bath in both bedrooms with lake views. Large verandah with stairs leading down to private lakeside deck hovering over the water. Complimentary two person canoe. Welcome platter on arrival. Spacious luxury lakehouse, located 8 metres from lakesedge. Contemporary indigenous theme with adobe walls. Fully self-contained, comprehensively equipped kitchen. The first bedroom includes a king bed and an ensuite. The second and third bedroom can be either king or two singles with a shared bathroom. The lakehouse also includes two powder rooms. Bedding preferences must be stated at time of booking. Double spa bath in both bedroom one and two with lake views. 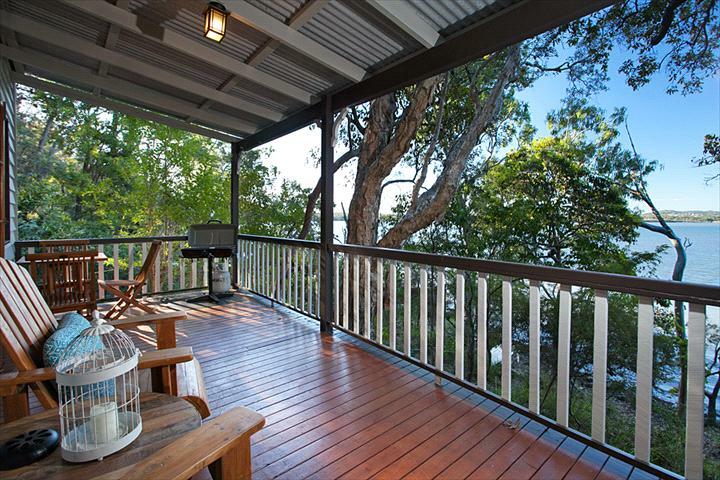 Large verandah with stairs leading down to private lakeside deck hovering over the water. Complimentary two person canoe. Welcome platter on arrival.